Your new favorite t-shirt is the softest, smoothest t-shirt you'll ever wear. Dress it up, or down, this shirt is available in colors that will complement any wardrobe, and shaped to flatter. 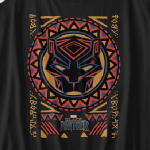 Check out this Wakandan tribal pattern design featuring a black panther head.